Country music stars attract large concert crowds from all over. For the Outlaw Music Festival, which is an annual assemblage of some of the biggest country luminaries, it has become a pilgrimage of sorts where the most zealous country music fan gather in massive volumes to savor the eclectic flavors of country music. Leading the pack, since its inception is country veteran star, Willie Nelson. One of this year's stops is right here at the Budweiser Stage on Friday 21st June 2019. 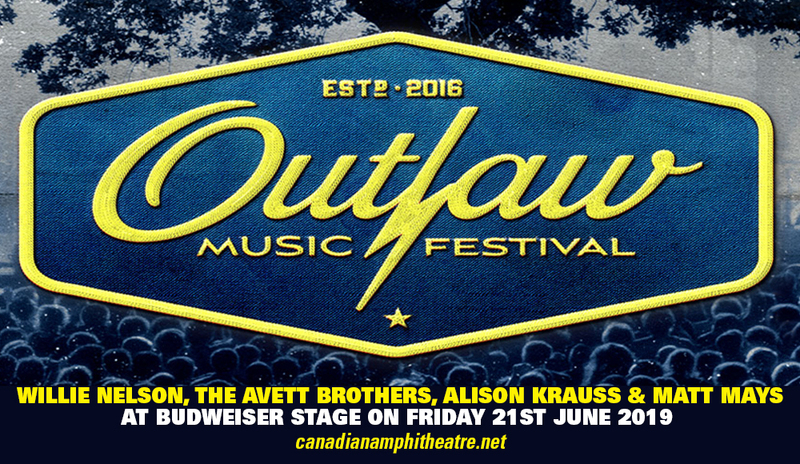 The Outlaw Music Festival line-up includes Willie Nelson, The Avett Brothers, Alison Krauss & Matt Mays. Check out tickets now as they sell out pretty quick. With an easy click to 'buy tickets' on this site, you and the rest of your family and friends will be well on your way to experience a country adventure like no other. Willie Nelson has not been content on basking on his glory days as a country music icon. He is one of country music's greatest stalwarts who tirelessly mounts country music events and festival that showcase a gamut of country music styles, sub-genres, and the artists behind them. One of Nelson's most auspicious projects is the Outlaw Music Festival. The inaugural show held in 2016 was initially intended as a one-off event, with Nelson, Sheryl Crow and Lee Ann Womack performing. Due to its rousing success, it returned as a touring festival and is now rolling on its third year. "We had so much fun on the Outlaw Music Festival Tour last year that we couldn't wait to get back out on the road with everyone," says founder Willie Nelson. Concert producer Blackbird Presents is at the helm of this mega concert production, and have seen and heard the clamor of fans of the years. "The fans told us what they wanted on the Outlaw Music Festival Tour in 2019, and I am thrilled to have delivered this to them. This summer's lineup with Willie Nelson and our caravan of artists continues to take the Outlaw Music Festival experience to a whole new level," says CEO of Blackbird Presents Keith Wortman. Lock-in this date and don't miss out on this exciting country music mecca. Book your tickets now!